Who Is Who In Life And On Facebook? Bookcover of Who Is Who In Life And On Facebook? How do we communicate in the real and in the virtual world? Do we really communicate what we mean? By refusing to communicate, what do we say? Are we different in the real and in the virtual space? 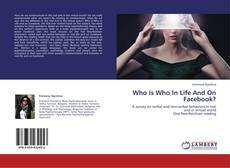 Who is Who in Life and on Facebook, the first ever written book on the subject, has some answers to these questions. Based on the body psychotherapy theory and on the author’s experience both as a body psychotherapist and as an active Facebook user, the book focuses on the five Neo-Reichian characters’ verbal and non-verbal behaviors in real life and on Facebook. Despite the existing belief that we can hide in the virtual space because of the absence of a live contact, the author examines the way our masks fall and how everything, which we upload, post, like, or share on the web, exposes our real characters - our fears, limits, illusions, lacking behaviors, etc. Written in a simple language, the book can be useful for psychotherapists, counselors, psychology students and people who are interested in their own and other people’s communication and behavior in real life and on Facebook.